Luci Barker: Revolution PRO Full Coverage Camouflage Foundation || Review! Revolution PRO Full Coverage Camouflage Foundation || Review! 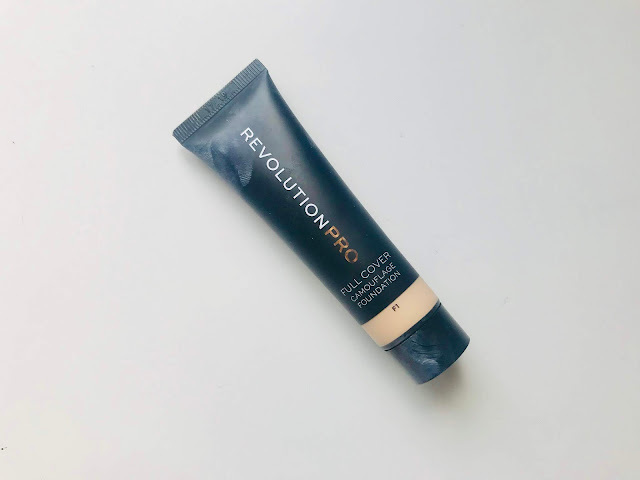 Hey there, you may have seen in one of my previous blog posts that I picked up the Revolution PRO Full Coverage Camouflage Foundation and you may know that I absolutely love Revolutions Fast Stick Foundation that I have previously reviewed, so I thought I would share my thoughts on this one too!!! Firstly, let’s talk about the packaging because that’s one of my favourite things to talk about with any product. The packaging for this foundation is very minimalistic but it’s still cute. You get a fairly decent amount of product ( ml) for just £7. Which I think considering the quality and how much I like the foundation I would be more than happy to pay this amount ...but we will get into that later in the post. As with the other Revolution Foundations & also their Concealers, the shade range is very impressive with 18 shades, with lots of different undertones!! I use the shade F1, which is the lightest shade and it's probably a little pale for me but I can make it work. I wore this foundation for probably about 10/11 hours and I can say that it genuinely felt and look just as good from the moment I applied and to the moment I removed it at the end of the day. I usually get pretty oily throughout the day and feeling like it needs setting again, however this seemed to stay at a comfortable finish all day. I did find that it wasn’t as matte half way through the day as it was when I first applied it, but it didn’t feel as though it was sliding off of my face and it felt very comfortable on the skin. Overall, I am very happy with this foundation and some of the reasons for this include the price, the shade range, the fact it’s full coverage, but in no way cakey. However, a few downsides just for me personally, is that it did slightly stick to my dry skin, I did have to use quite a lot of foundation because both my brush and my Beauty Blender sucked it up (which isn’t necessarily the foundations fault) and the shade I bought was a little pale, but I know I would like it even more if it matched me better. If you have normal I would really recommend this foundation to you, maybe not so much to those with dry patches but even with oily skin I think this would work a treat, but just be sure to set it well or even bake it and use a mattifying primer, which I’m sure you all do anyway!! So there are my thoughts on the new Revolution PRO Foundation, I really hope you enjoyed this post. If you’ve also tried this foundation, then I would love to hear your thoughts on it in the comments below. I was intrigued when they came out with this foundation as my sister picked it up and said it is quite a thick consistency on the skin. I'm glad you've mentioned about it sticking to drier areas on your skin as I have quite a few of those! Great review. I definitely want to try this foundation because of how affordable it is but I am glad that you mentioned that this is more suited for people with oily skin! Loved this review!